Below is an example of a powder day on January 23, 2017. Why Ski Alta On a Powder Day? Alta is one of my favorite places to ski on a powder day. The Alta ski patrol gets out early to make the terrain safe. Most of the time, even on a deep powder day, they open the lifts at their 9:15 am start time. On a powder day, you'll start skiing on the Collins or Wildcat lift. Both of these lifts have their benefit on deep powder days. Collins is a high-speed quad and Wildcat is a two seat chair, but both deliver the goods on a powder day. The size of the lift line may determine what lift you take on your first run. For this post, I'll discuss the runs you can access by taking the Collins lift on a powder day. 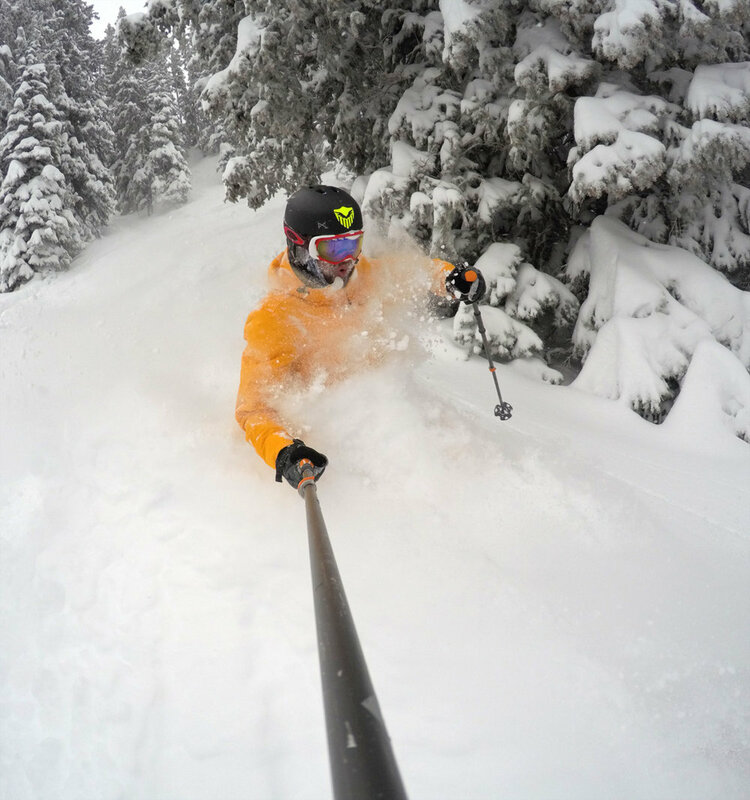 Where Do You Ski On a Powder Day at Alta? Like most ski resorts on a powder day, it's going to be mad rush to the untouched deep powder. For this example, let's say your the 15th chair on the Collins lift. If you want the perks of one of the early chairs, you'll want to arrive early and get in line around 8:00 am. If you arrive at 8:45 am, you'll be far back in the long line. Early bird gets the worm (powder). So your on Collins lift, where do you ski? If you're one of the first chairs, you pretty much can ski any where. You will be skiing untouched deep powder, but remember the mad rush of hundreds of skiers is right behind you. You can feel them, so don't hesitate and enjoy the deep turns in the world's best powder. Here are a few options for your first runs on a powder day at Alta when riding the Collins lift. As you approach the top of the Collins lift, you'll see a nice steep run called Spruces. This is an awesome run to ski as a visiting skier. You just follow the ski lift the whole way down. The picture above was taken on Spruces run. It's steep and fast. Before you get on the Collins lift, ask if ski patrol if the High Traverse is open. If it is, you'll have some great options to ski on a powder day. Most of the Alta locals will take this option on a powder day. Once you get off the Collins lift, you take the cat track under the lift and head to the east. It's a traverse that will take you to the other side of the mountain. Once you're over there, you can ski any of the bowls. I recommend High Greeley. I've had some awesome deep turns on High Greeley. You will have to stay left to make sure you make it back to the Collin's lift. If you ski High Greeley all the way to the bottom, you'll arrive at the beginner lift called Sunny Side. Take the High Traverse over to Eagle's Nest. You'll ski amazing turns down Eagles Nest's and cut over to North Rustler. This terrain has cliffs, rocks, but once your on North Rustler you'll be skiing deep powder. The High Rustler area keeps the powder longer because it is a little tricky to get to. So you can ski your third and fourth runs here on a powder day. These are a few of the runs I recommend you ski from the Collins lift on a powder day. If it's a deep day, you can't go wrong anywhere. Alta is one of my favorite places to ski on a powder day. Plus the staff and skiers are some of the nicest people in the ski world. Most people say, "No friends on a powder day." At Alta they say, "Friends Welcome!" What did I capture the video and pictures with? Pictures were taken using the GoPro HERO4 Black in multi-shot time lapse mode at .5 seconds.Video was shot using the GoPro HERO4 Black. Set up using the following settings.